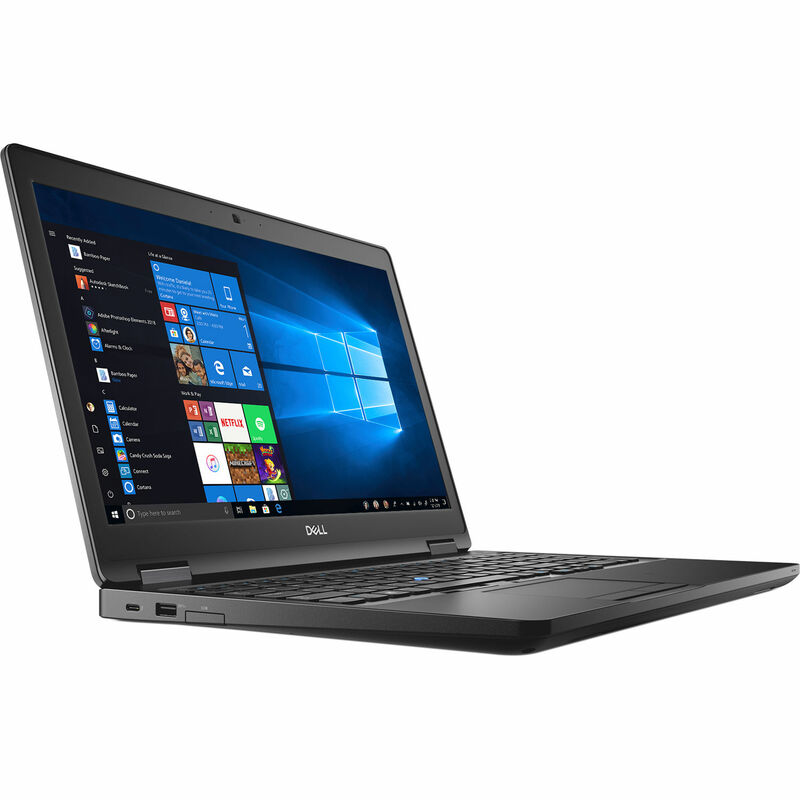 Designed with powerful performance and a compact form factor, the 15.6" Precision 3530 Mobile Workstation from Dell is thin, light, and ready to back your ingenuity. It is powered by a 2.6 GHz Intel Core i7-8850H Six-Core processor that allows you to run multiple applications simultaneously. The processor also features a boost speed of up to 4.3 GHz, and the system's 8GB of 2666 MHz DDR4 RAM allows the computer to quickly access frequently used files and programs, as well as help to ensure efficient multitasking. The system's memory comes in a 2 x 4GB configuration and both slots may be upgraded to 16GB each for a max system total of 32GB. The 15.6" display features a Full HD 1920 x 1080 resolution, a 16:9 aspect ratio, 300 cd/m2 brightness, and 72% color gamut coverage. The dedicated NVIDIA Quadro P600 graphics card has 4GB of GDDR5 RAM and delivers a sharp, clear picture. You'll also be able to output video to an external display using the built-in HDMI 2.0 and VGA ports, as well as DisplayPort over Thunderbolt 3. For storage of your files, this Precision 3530 is equipped with a 256GB M.2 SATA SSD. If you want to add external storage, optical drives, memory card readers, and more, the Precision 3530 offers one Thunderbolt 3 port and three USB 3.1 Gen 1 Type-A ports, one of which is equipped with PowerShare technology for charging external devices using battery power. Gigabit Ethernet and Wi-Fi 5 (802.11ac) are built-in for wired and wireless networking, and Bluetooth 5.0 technology will also allow you to connect additional compatible peripherals. So that content from memory cards may be accessed, a built-in SD 4.0 card reader supports UHS-II SD/SDHC/SDXC, MMC, and Memory Stick, Memory Stick Pro, Memory Stick HG, Memory Stick Duo, and Memory Stick XC flash media so users can download content from their digital camera. Other integrated features include a 720p webcam, two integrated microphones, and 2W stereo speakers. The 15.6" Precision 3530 Mobile Workstation includes a power cord, a 130W AC adapter that operates using 100-240 VAC at 50-60 Hz, and a 4-cell / 68Wh lithium-ion polymer battery with ExpressCharge. The installed operating system is Windows 10 Pro (64-bit) and protection is provided by a limited 3-year hardware warranty with onsite/in-home service after remote diagnosis. Experience innovation with the thinner, lighter, premium-built Precision Mobile Workstation. Built with a 2.6 GHz Intel Core i7-8850H Six-Core processor, 8GB of 2666 MHz DDR4 memory, and an NVIDIA Quadro P600 graphics card with 4GB of GDDR5 memory, the Precision Mobile family is engineered with power to match your ingenuity. Free with your Precision workstation, the Dell Precision Optimizer delivers faster application optimization with a single click. It also automatically tunes your workstation to run popular ISV applications at the faster speeds, has automated system updates, and provides analytics to address resource bottlenecks. Or, upgrade to the Dell Precision Optimizer Premium version, an AI-based performance optimizer software for workstations. This program learns the behavior of user-specified applications, identifies optimization opportunities using machine learning, and applies performance improvements. The 4-cell / 68Wh battery features a faster charge to get you up and running quickly, so you can stay productive on the job. Designed with cable docking, this small and compact workstation can carry large projects. Support for 4K video to an external monitor at 60 fps via HDMI 2.0 allows you to create and edit your work with improved clarity. Box Dimensions (LxWxH) 21.8 x 13.8 x 3.2"